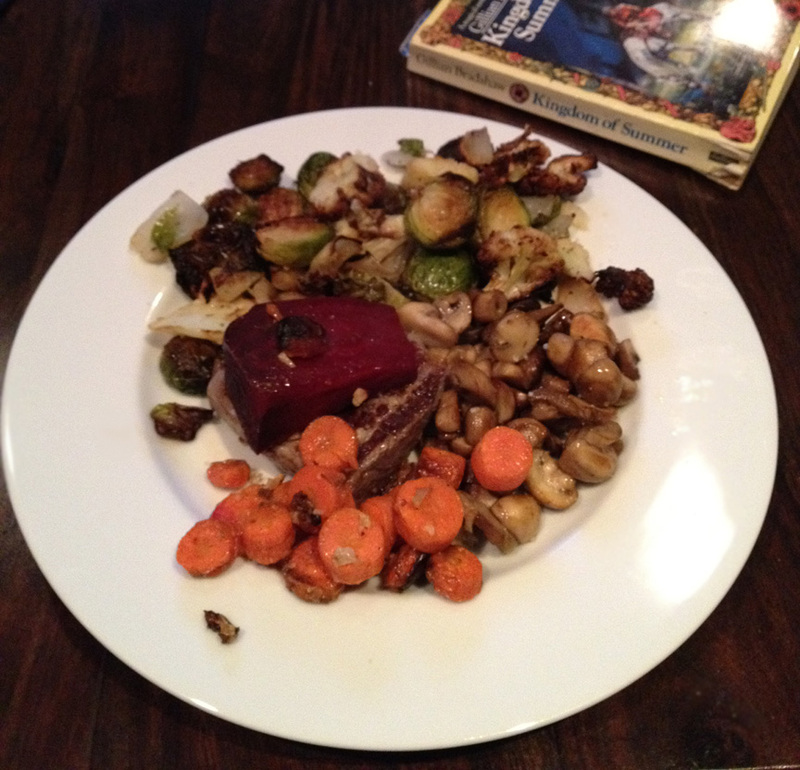 This is the kind of thing I’m eating for dinner on my new food regimen*: steak (grass-fed, and cooked on a Foreman grill), roasted beet, carrots, cauliflower, onion (just tiny bit) and brussel sprouts, and mushrooms (sauteed in olive oil). Book (old but ordinary-sized mass market paperback) for scale. Aperitif was a couple of little bottles of Perrier sipped by the fire with Kelley. Starter was a big gulp of flaxseed oil. Dessert was a pile of blueberries and raspberries, with green tea (decaf). Delicious. I have no idea how many bazillion calories it amounts to. But I ate every scrap (and a bit of Kelley’s). The sad part? I’ll be hungry again in two hours. No alcohol and no grains will do that to a person. Breakfast and lunch is a tad more austere (protein only for breakfast–fish or eggs; protein and non-carbolicious veg for lunch). But at night–well, evening (no food after 8:00 pm)–I pig out. Strictly speaking I shouldn’t have had beets and carrots, but they were leftovers from yesterday. I couldn’t let them go to waste. * I really will blog about this regimen coherently. Too much going on right now to organise the information properly. You are heroic! And the food looks good. My alcohol consumption is limited because I take lithium and prozac, and it has not been easy. This sounds a lot like the diet I've been on (for weight loss) for 2 years. High protein, eggs, very limited carbs, no dairy, limited but specific fats (like flax seed oil,) lots of unsweetened cranberry, no booze. I feel great, lost 30 lbs, plan to lose another 30 over the next 2 years. I just re-read “Always” and was taken by Kick's diet for Aud. Food/love is so important. barbara, Caryl, it's the no bread no alcohol parts of the equation that are killing me. The first few days I literally had visions of sandwiches. Total withdrawal syndrome. Ooof. I agree with Barbara and Caryl, though: looks delicious; I don't feel sorry for you. As with any abstinent system, you have to eat the forbidden fruits every now and then. So plan that bread pudding and Calvados feast, or whatever it is — make it worth the wait. X, L.
Anon, well, after some adjustment, I don't feel sorry for myself, either. Hi Nicola, could you tell more about that diet? or point me to more detailed description? Tomke, I haven't written about it properly yet. I will.